On this first day of Spring Training, we're already into the rulebook as an overthrow in Florida led to a Little League home run for Yankees batter Miguel Andujar. Though the teams pay no mind, the ump does. As baseball collectively shakes off the dust this late February, there are bound to be a few errors along the way, and we too would do well to review a fundamental rule that made an appearance on Friday concerning a ball thrown out of play. With two out and a runner on first base in the bottom of the 6th inning, NY batter Andujar hit a fair fly ball off of Phillies outfielder Chris Coghlan, who retrieved the ball on the ground and threw to first baseman Brock Stassi, who in turn threw to third base in an attempt to retire Andujar, who was trying for a triple. 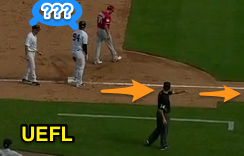 Stassi's throw flew past third baseman Taylor Featherston and bounced into (and then out of) the visitors' dugout back onto the playing field, where it was retrieved by left fielder Tyler Goeddel, alertly backing up the play, as batter-runner Andujar scampered back to third base. U3 Mark Wegner signals "Time." 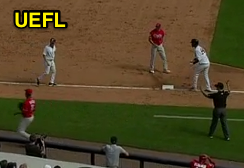 Fortunately for New York, 3B Umpire Mark Wegner saw the entire sequence and, having correctly ruled the ball out of play, awarded Andujar home plate as a result of the ball thrown out of play. Andujar's position at the time of Kingery's throw was at some point between second and third base. Common question: Does it matter that the ball bounced back onto the field after momentarily entering the dugout? After all, didn't appear to have altered the play. Answer: As soon as the ball leaves the playing field, it is dead and subject to award. It does not matter what happens next (see emphasized portion of rule, below). Rule 5.06(b)(4)(G): "Each runner including the batter-runner may, without liability to be put out, advance...Two bases when, with no spectators on the playing field, a thrown ball goes into the stands, or into a bench (whether or not the ball rebounds into the field)...The ball is dead. When such wild throw is the first play by an infielder, the umpire, in awarding such bases, shall be governed by the position of the runners at the time the ball was pitched; in all other cases the umpire shall be governed by the position of the runners at the time the wild throw was made." Wrap: Philadelphia Phillies vs. New York Yankees, 2/24/17 | Video available via "Read more"